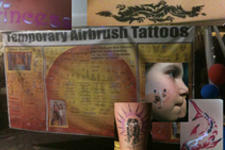 Air brush tatoos and other temperory tattoos. This item is one of our most popular activities for corporate events and schools. With over 1500 designs available in multiple color choices, your guest will have no problems finding one they like. Since our staff member is also an artist, he can customize any tattoo or design free hand.